Fancy Gorilla & Chimpanzee Trekking? Jump aboard the Uganda Express Safari! There are many reasons to visit Uganda, and once you have witnessed the true beauty of its snow-capped mountains, mirrored lakes, rich verdant forests, and ever-changing landscapes, you will understand why Winston Churchill named it the “Pearl of Africa”. Thousands of international travellers flock to Uganda each year in search of something different, and while many are intent on trekking volcanoes, white-water rafting down grade-5 rapids, bungee jumping next to Bujagali Falls, or testing their endurance in the Ruwenzori Mountains, most visitors are looking for just one thing – and that is Uganda’s Mountain Gorillas. It is estimated that there are just 900 Mountain Gorillas left in the wild, and most of them reside in the Bwindi Impenetrable National Park, a UNESCO World Heritage Site in Uganda, and so it is the perfect destination for those who dream a tracking these magnificent creatures in their natural habitat. Gorilla trekking tours are neither cheap nor for the faint-hearted, but by booking a full escorted trip with a reputable company, you can track Uganda’s Mountain Gorillas and Chimpanzees, and visit all the must-see sights aboard the Uganda Safari Express! Day 1: Arrival in Entebbe. Transfer from airport to your accommodation either in Kampala or Entebbe. Day 2: Transfer from Entebbe / Kampala to Kibale Forest National Park along a scenic route. 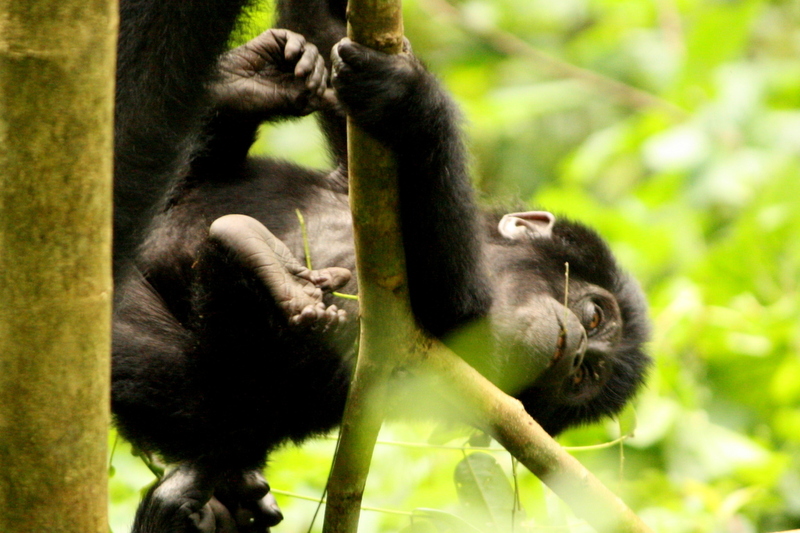 Day 3: Kibale Forest National Park – activities include Chimpanzee tracking and Bigodi Swamp walk. Afternoon drive Queen Elizabeth. Day 4: Queen Elizabeth National Park. Sunrise safari & boat tour on the Kazinga Chanel. Day 5: Drive to Bwindi Impenetrable National Park. Visit the tree climbing lions of Ishasha. Day 7: Drive to Lake Mburo National Park. Afternoon game drive or boat cruise on the lake. Day 8: Morning Bush Walk, Game Drive, Horseback Safari or Mountain Bike Adventure. Depart Lake Mburo National Park to Kampala or Entebbe stopping at the Equator Crossing for those all important photos! Next Post Discounted Gorilla Trekking Permits Available Now in Uganda!